Published online in the Nov. 29 early edition of the Proceedings of the U.S. National Academy of Sciences ("Identifying human influences on atmospheric temperature"), the study compared 20 of the latest climate models against 33 years of satellite data. When human factors were included in the models, they followed the pattern of temperature changes observed by satellite. When the same simulations were run without considering human influences, the results were quite different. “We can only match the satellite record when we add in human influences on the atmosphere,” said Michael Wehner, a research scientist at Lawrence Berkeley National Laboratory (Berkeley Lab) Computational Research Division and a coauthor of the article, which involved colleagues from 16 other organizations and was led by Benjamin Santer, an atmospheric scientist at Lawrence Livermore National Laboratory (LLNL). To help eliminate the influence of naturally occurring climate variability, the team ran two different kinds of models: Models that included historical and projected increases in carbon dioxide and “aerosols,” such as smoke and dust, and one without. The second set of models acted as a sort of baseline that allowed researchers to filter out the effects of phenomena such as the El Niño/Southern Oscillation and the Pacific Decadal Oscillation. This “noise” can obscure the “signal” scientists are searching for in satellite data and models. 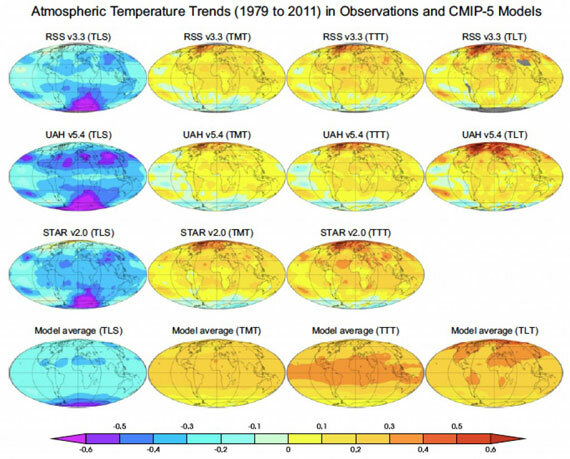 Using this information, researchers were able to distinguish the clearest signal yet linking human factors to satellite-observed temperature changes between 1979 and 2011. Analyzing geographical patterns of atmospheric temperature change over the 33-year period of satellite observations, researchers found that the lower stratosphere cools markedly in both observations and computer models. This cooling is primarily a response to the human-caused depletion of stratospheric ozone, due mostly to the once-widespread use of chlorofluorocarbons (CFCs) in spray can propellants and coolants, among other uses. The observations and model simulations also show a common pattern of large-scale warming of the lower troposphere, with largest warming over the Arctic, and muted warming (or even cooling) over Antarctica. Tropospheric warming is mainly driven by human-caused increases in well-mixed greenhouse gases, primarily carbon dioxide.